The Urbana Depot was a typical looking small depot with bay in front and slate roof built around 1874 by local resident and businessman, Charles Miller, for the people of Urbana after the Cincinnati, Wabash and Michigan railroad opened in 1872. Soon after it was built he began shipping grain. This was a one of a kind depot as the woodwork inside was spectacular including light colored hardwood floors in the waiting area with polished benches on all four walls and large windows across the back so it was light and airy. Compared to it, Anderson depot waiting area was dismal. The door to the office area was to the left as one entered the station beside the ticket window. To the front of the office area was a huge desk area of beautiful polished bleached oak spanning the entire area of the bay where the telegraph equipment lay and two light oak chairs were pulled up. On the left end of the bay on the wall was a clock and below it a huge oak telephone with a crank on the side. Dad was constantly pulling out his pocket watch to see that it was synchronized with the depot clock. In the middle of the bay area on the wall beneath the window was an expanding telephone with headsets and the telegraph equipment. The curved polished dark mahogany in the area of the ticket window was the most beautiful of all including drawers underneath for tickets and Western Union telegrams and a lovely cabinet beside it. 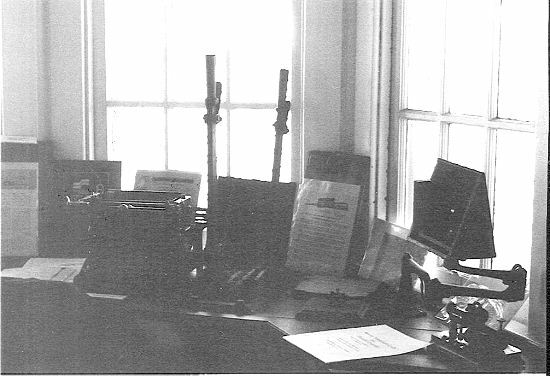 Along side the cabinet was a huge rolltop desk with a beautiful paper weight and beside it at a 90 degree angle was a manual typewriter on a stand. There were cabinets built across the whole back of the office area of the depot about four feet high with a window above them and dad usually had his lunchbox on top of those cabinets. Opposite his desk was a small closet for his coat and boots and more cabinets and beside that was the wood burning stove. I have been in many small depots and never saw anything that beautiful as far as the woodwork. The door to the Urbana depot freight area was opposite the door from the waiting area and there was a step down and on the back wall was a huge scale. That was my refuge when trains approached as I was sure that huge scale would protect me if a train jumped the tracks. I loved going with dad to the depot as it was a pleasant place to be in and it was a constant hub of activity with many farmers or businessmen stopping in to catch up on the latest news. During school vacations I would often go to the depot with dad and spend afternoons visiting Urbana School. My job upon arrival was always to dust the waiting room benches and dust mop the floor and then go to the post office to pick up the mail while dad made the fire and dusted his office area. Then I was free to pretend to sell tickets and write out messages on the colorful Western Union telegrams while dad typed away on his typewriter. Everything sent out from the depot had to be sealed with the New York Central seal and my favorite activity was sealing large envelopes. Dad would light the brown wax stick and drip it on the envelope and let me help press the seal. I always hoped he would have two envelopes to seal as it was double the fun. Inside the depot one could hear the telegraph going constantly. Dad would jump up from his desk when a message was for him and connect the equipment to his office by pushing a peg in a particular hole in a wooden box and then put on earphones and begin writing. Dad had lots of contact with Bolivar. If a train was leaving Urbana he would call Bolivar and if one had left Bolivar he was contacted and then prepared for its arrival. One day Bolivar called and told dad a train was heading to Urbana. As I saw it approach from the bay dad asked if I wanted to go out to meet it and I said "No, I would stay inside" and then I ran to the freight area as the huge steam engines rocked the depot when they went through and it was frightening. The train stopped and after a couple minutes all was quiet so I emerged from the freight area and walked to the depot door to see what was going on. Right in front of the door was the engine and the engineer immediately saw me and said "Ernie is that your baby?" Dad said "Yes" and he told dad "Bring her up here so I can see her". Dad whisked me up and held me up above the huge wheels of the steam engine and just then they went "Pst Pst" and I was simply terrified and I sobbed "No, No" so dad put me down. The engineer asked if I wanted to come up in the cab and I defiantly said "No" and ran back in the station. I must have been really traumatized because even into adulthood I had steam engine revenge dreams. I dreamed I would be walking down the street and when I heard a train coming on nearby tracks I would head the other direction to get out of its way and then turn around and see the steam engine jump off the tracks and follow me down the street. Part of the reason for such dreams was because steam engines would seem to come out of nowhere under the dark train sheds in Chicago as I boarded the train when I was little and I would sometimes dream I was somewhere in a large building and suddenly a huge door would go up and out would come a steam engine toward me. Thank goodness, I never had any bad dreams about diesels. I did have lots of fantasy NYC RR dreams where we would get on a train on Sunday and head east and sit in the Club Car and it would be so great until Monday morning came and I discovered everyone had gone back home. I guess subconsciously I wanted to take the train east as dad had always wanted to go see Lake Champlain and made many attempts in my sleep but never got there. I loved to walk the rails pretending they were a balance beam. I actually got quite good at it. Sometimes I would I would walk on the railroad ties skipping every other one as I walked or look for pretty rocks. In spring or summer I would walk along the right of away and pick wild flowers or wild strawberries. Dad was probably the only agent who had bouquets in his office. I was always on the alert for coal that might have fallen off coal cars as we had a coal furnace and some years there were coal strikes and coal was in short supply. I would often help dad sweep out box cars before a train picked them up. I didn't play in the boxcars as I was afraid one of the trains coming through would take it with me still inside. The kids in Urbana would hang around the depot after school and we would often sit on the railway express cart and eat a nickel ice cream cone gotten from Devers Grocery nearby. Once a train hit a pheasant and the engineer told dad it was nearby. I had never been that close to a pheasant and was thrilled dad let me keep many of the beautiful feathers. One Christmas eve just before we moved to Wabash we were all around the tree opening gifts when suddenly we heard a train whistle in the clear night air and my oldest brother who was in high school jumped up and headed for the door. It was his job to put the mail on the train at night at the Urbana Depot and with all the excitement of Christmas eve he had completely forgotten. His right leg was crippled from polio so there was no way he could run to the depot. I don't think he made it in time to get the mail on, but at least he got the mail that was dropped off deposited at the right place. Dad was partial to steam engines and wasn't happy when diesels replaced steam. When we were on a train to Flagstaff, Arizona and they had to have a steam engine push the train up the grade dad commented that you just never could beat those old steam engines. When we stopped at Flagstaff the conductor announced we would all leave the train and go inside the Fred Harvey Restaurant for lunch. Everyone got off the train including the engineer and conductor and went into the restaurant's massive lodge-like dining room. When we finished eating we all got back on the train and it headed on west. I had never eaten with conductors and engineers before and it was a one of a kind experience because in all our travels it never happened again. When the Urbana Depot was closed by the New York Central in 1960 it was almost immediately torn down and the sidings ripped up and the beautiful old brick platform removed. I managed to salvage a bit of slate and a few spikes. A short time later the grain elevator was torn down. For years when I came home to Wabash I drove up to visit the sight of the old depot as it was like losing an old friend. 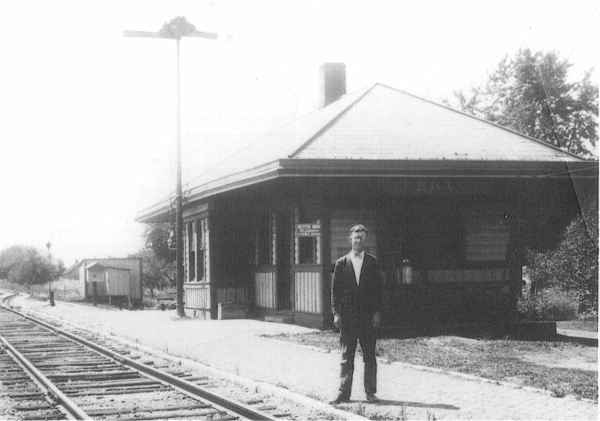 Today there is no sign a depot or elevator ever existed in Urbana. Cincinnati, Wabash and Michigan Railroad 4-4-0 "A. G. Wells" used to work the Wabash Valley. - Postcard Photo, Karen Dinsmore Collection. Urbana with 'Dad' - Probably taken in the late 20's or early 30's as he looks quite young. Most likely a 'special occasion'. - Karen Dinsmore Collection. Copyright 2004 by Roger P. Hensley. All Rights Reserved.